It ends Saturday so dont miss America's Whispered Truths at the Archer Gallery, which I reviewed recently within a cluster of related shows. 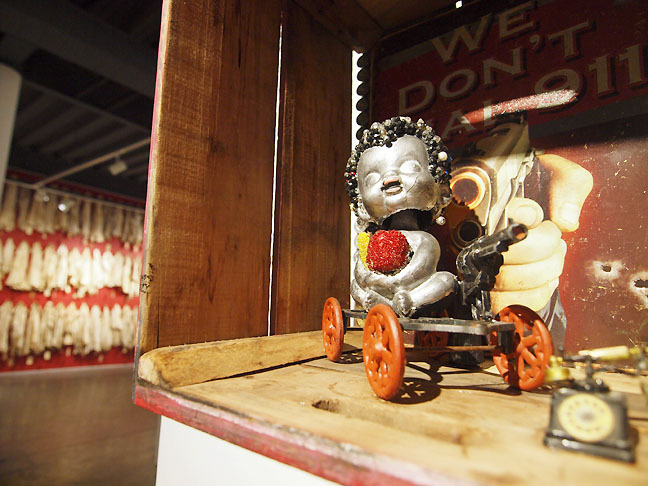 In this duo exhibition Renee Billingslea and Willie Little dont pull any punches as they each explore the not so subtle violence of racism through powerful assemblage and installations. 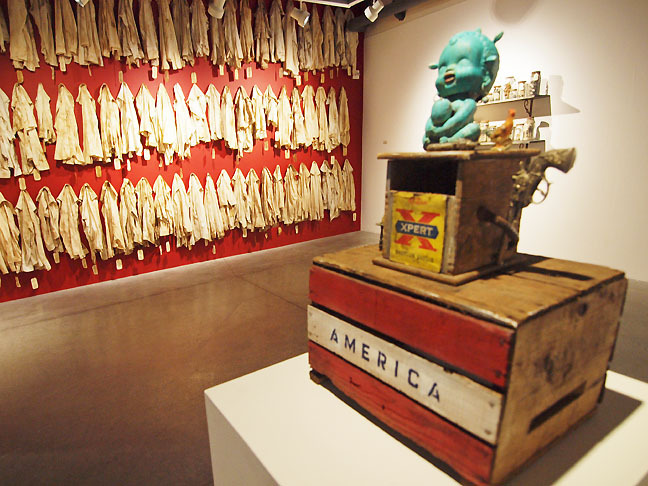 If you want a truly unvarnished yet nuanced exhibition, America's Whispered Truths screams in silent terror, giving scope and sobering scale to the whole discussion of racism in America. This month marks my Twentieth Anniversary of moving to Portland and arguably that decision changed Portland in many ways (addressing history history with, Judd and Rothko, and a new appreciation of new media with Pipilotti Rist, Hank Willis Thomas and Cao Fei + talent scouting locals, etc). Simply put, I challenge Portland. There is still much more is to be done as the city doesnt effectively support its best artists yet (other cities do it for us... but still cmon). Considering all this, I've been spending a lot of time looking at art, with a one night Spring Equinox show as well (it was very underground on purpose). As part of my spring cleaning process here is a cluster of reviews, with an eye towards exposing some common threads and themes. Key: "*" Indicates show still open and "**" indicates it is still open for today's First Thursday (yes PAM is open for First Thursday). As you can see Portland's art scene is far from dead, challenges sometimes strengthen things and I see evidence of it here. The Map is Not the Territory is the Portland Art Museum's revolving triennial replacement for the Contemporary Northwest Art Awards (which among artists was nicknamed the conservative art awards). 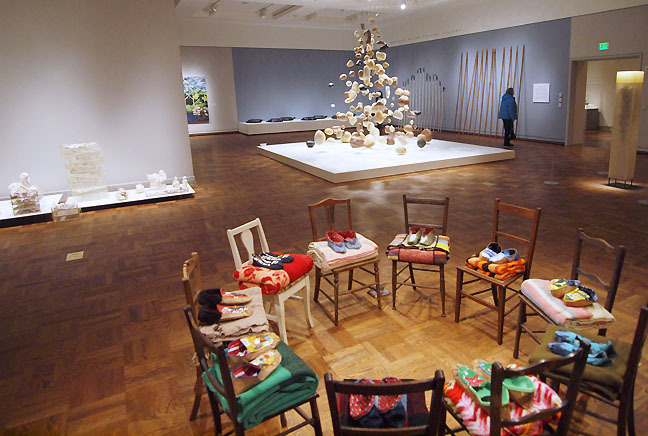 For this program instead of a stereo typically "Northwest" approach to traditional materials and subject matter like rain, glass, trees and fetish of effortful handwork the show has thankfully taken on an anthropological approach, which is essentially an expose on the human experience. I found it more satisfying than the CNAA's or any of the other weak institutional regional surveys Portland has been routinely subjected to recently. Mostly that is because this show felt connected to the times rather than trying to ingratiate itself among various special interest patronage factions. In short the work felt personally involved rather than a checklist of token inclusions. Themes like border crossings, ancestors, roots, food, shelter and the uneasy dance of the natural and man made are all topical and relevant, if a little obvious themes to explore. Think of this a as a show where PAM evolves from merely a map to patronage to one that asks the broad question of, "What are we doing here?"